When it comes to finding kitchen design inspiration, Houzz is one of the best online platforms you can use. The website allow you to not only browse hundreds of thousands of photos for ideas, but it also connects you with local designers and contractors in your area so you can make your dream designs a reality. If you're planning to use Houzz to plan your kitchen remodel, here's a step-by-step guide for doing it right. If you haven't already, you'll want to create a free account on Houzz. This is a necessary step to access all of the site's features, including the ability to save photos you love, follow and contact designers, and, if you end up hiring a professional through the site, share ideas with them through the Houzz "Ideabook" feature. (More on that later). Once you sign up, you'll want to start searching the site for ideas you love. There are a few approaches to doing this. If you don't have any specific designers in mind who you want to work with, or aren't entirely sure of the style direction you want to take for your kitchen, you can simply start searching the site's thousands of photos for things you like. Just enter search terms in the search bar at the top, and click "In photos." Then, when you find images you love, you'll want to save it to an Ideabook, by clicking the green "Save" button on the bottom of the photo and choosing the Ideabook you want to save it to (or creating a new Ideabook). The other way to search is by narrowing your research down to local designers. In that case, you'll want to search the type of professional you're looking for and click "in Find a Pro." Houzz will default the search to your location (or you can type in the area you want to search), and pull up area professionals. Reach out to Local Designers and Contractors. One of the best benefits of using Houzz is the ability to research designers and contractors in your area. 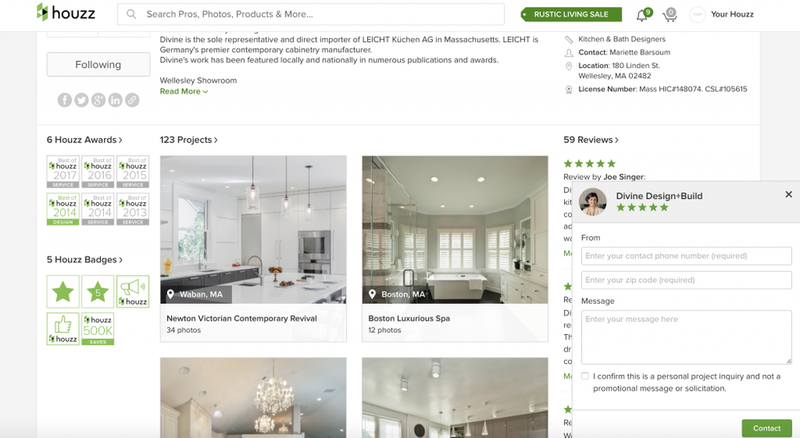 By viewing a desinger or contractor's Houzz profile you'll be able to see their portfolio and photos of the work, reviews from past clients, links to their website and contact information all in one place. If you find someone you want to contact, you can also reach out directly to discuss your project further. Last but not least, if you hire a designer, you'll have the ability to collaborate with them directly through Houzz. You can invite your designers to collaborate one your Ideabooks so they can see the photos of designs you love, and your designer will also be able to share their ideas with you, too. And check out our profile on Houzz, too!